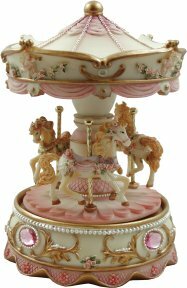 This superior collection of musical carousels are individually cast with the finest of detailing and meticulously painted by hand. A small, elegant musical carousel from the Distinction Series. Enjoy discovering the subtle differences as the carousel turns to reveal the horses individual characteristics, each of which are set into place on a twisted brass rod. A collectible item for the carousel connoisseur. Clockwork wound by turning the top of the carousel.